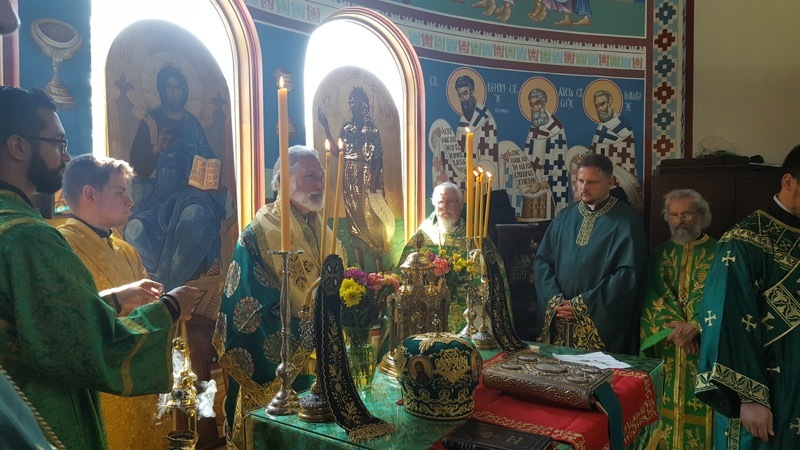 By the grace of God, and with the blessing of His Grace Bishop Irinej of Eastern America and upon the recommendation of Hieromonk Maksim, the spiritual father of the monastery, on May 29, 2018, Pentecost Tuesday, the first annual pan-Orthodox Sabor was held at the monastery. 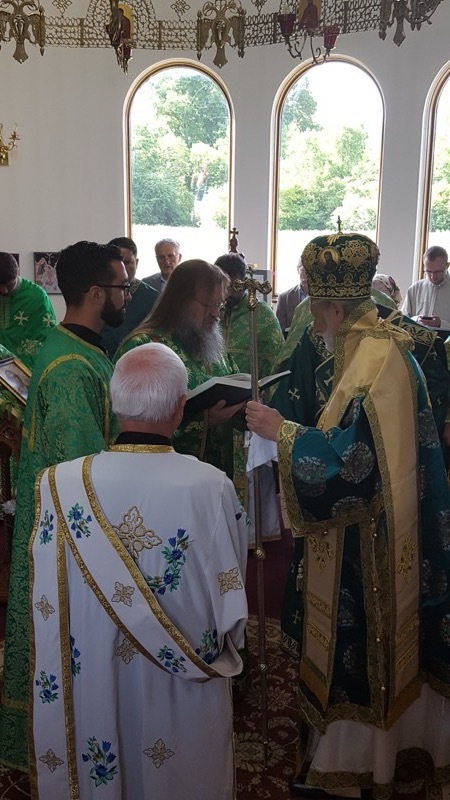 On this occasion the Holy Hierarchical Divine Liturgy was served by the diocesan bishop, His Grace Irinej, with the con-celebration of 14 priests, 2 protodeacons and 3 subdeacons and in the presence of clergy, monastics and the faithful people. 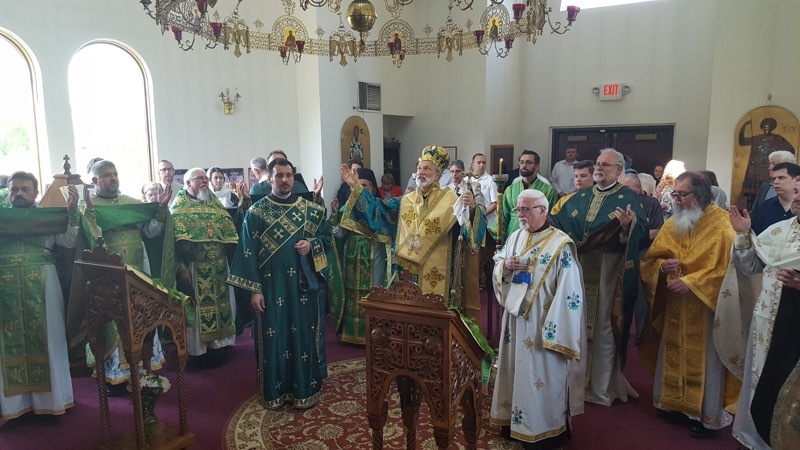 At the beginning of the Divine Liturgy His Grace, the bishop, ordained the worthy gentlemen, Milan Damljanovic and Michael Pancoe, to the rank of Reader and then Subdeacon. The Njegos Choir sang the responses at the Divine Liturgy, together with Protodeacon Sergei, directed by Professor Nikola Resanovic. After the gospel reading Bishop Irinej offered a homily. At the conclusion of Divine Liturgy and refreshments at the monastery quarters, an agape meal was prepared for all the faithful. During the solemn meal, Fr. Maksim greeted the clergy and all the faithful gathered, stessing the need for more frequent gatherings. At the end Bishop Irinej addressed everyone wishing first of all Fr. Sinisa Hrvacevic a successful mission in the fatherland (Srem) as he is preparing his move soon. Then, the bishop thanked all of those who attended and congratulated the new subdeacons. 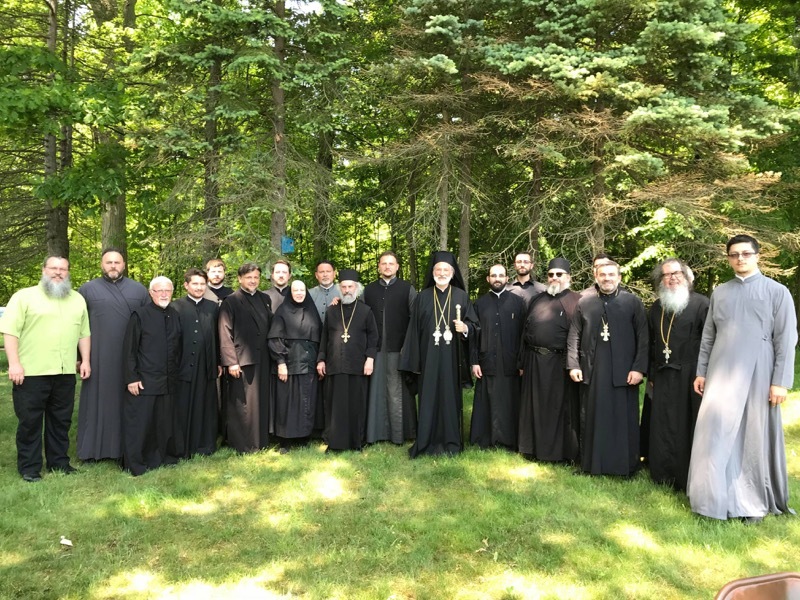 Following the prayers of thanksgiving at the trapeza, the clergy and people continued their fellowship with their spiritual fathers and bishop on the monastery grounds. It was beautiful to see the clergy and people gathered from many different churches at one place. This was truly a day to remember at our monastery.